I did it. I wrote a poem every week for an entire year. Why? Why the heck did I take on something like this? Why would anyone take on such a task? Last year I spent the month of April writing a poem a day. That was 30 poems, most of which were quick reflections on what was happening in my life, the world around me or in my mind. This was different. 52 poems. One per week. And at someone else’s bidding. That someone else was poet Jo Bell. A year ago, Jo offered a challenge to some of her friends and followers: join a closed group on Facebook wherein poets would be given weekly prompts and asked to write and post their poem to the group. We were also asked to read, comment on, and critique each others work. The prompts were one word or a phrase or just an idea. Some of the challenges were excruciatingly hard, especially those that asked the poet to get out of his or her own skin, style or comfort zone. Others fit nicely into a familiar pattern, yet encouraged the poets take their own style to a new level. The first observation I have about this group is what a wonderful collection of people Jo attracted. As the year went on, many of us grew close and supportive of each other’s work and struggles. Some of us have became friends outside the group. The second is how gratifying to get almost instant feedback on a new poem or idea of a poem. 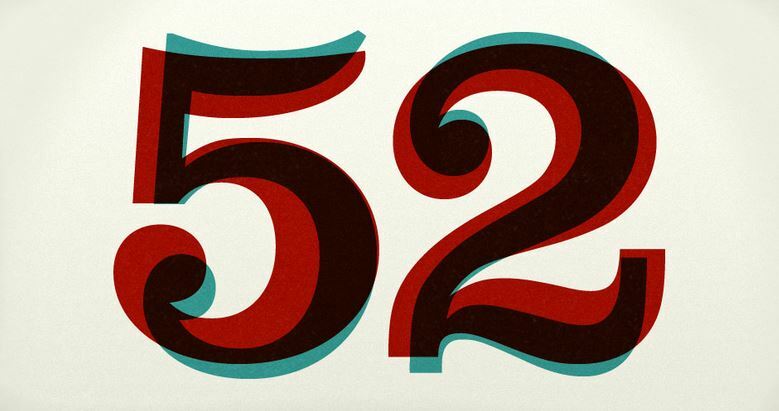 52 was like a private workshop that helped flag lazy writing, praise winning phrases, and challenge each other to improve our work. The third observation is how HARD this challenge was to accomplish. Some weeks came easier than others — being on vacation, honeymoon, or holiday certainly helped — other times, when the week was particularly busy at work or something else was going on (my wedding! ), it was more difficult. But I did it. I wrote a poem every week. How many of the poems will actually survive is another issue. At least one, “Weather,” from the sixth week of the year, has been accepted for publication. Others I’ve read at readings to some applause. Writing a poem each week was certainly worth doing, but I don’t think I’ll try it again. I don’t write well this way, with the pressure of a looming deadline (poems had to be posted before the following week’s prompt), I prefer to let the poem come to me and steep, and work on it as I see fit. And yet, this challenge has had a positive impact on my work. It has freed my work somewhat — many of the challenges were not the subject of my past poetry; some forced me to write about things I never thought to tackle in poetry. I’m grateful to Jo for the challenge and to those who read my work and shared thoughtful comments on my posts — or called me out when I wasn’t hitting the mark. There’s a handful of members with whom I’ll stay in touch and perhaps even continue to share poems. Most of them I would not have met were it not for Jo’s group and the platform of Facebook. As for the poems, I plan to spend the next year going over them with a sharp pencil and a sharper eye, finding the gems, excising the fakes, and possibly building this group of 52 poems into something worthy of the group and this very special experience.